← Results are in for poll & New Years resolutions! New item, SOPA/PIPA & new project? Hello everyone! I’m happy to announce the first new design of the year are completed! 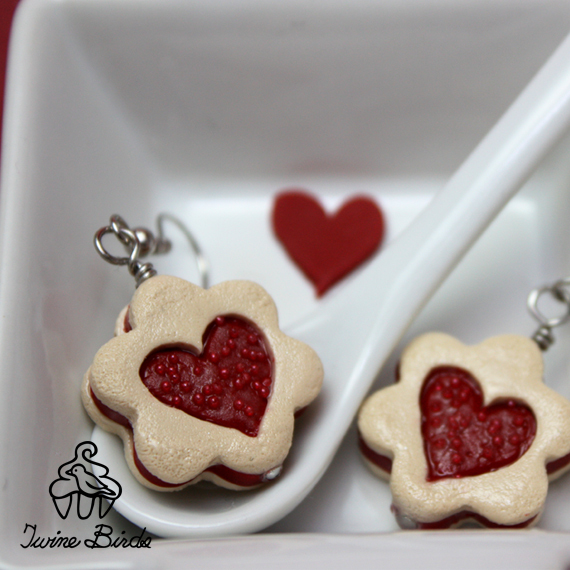 They are jam cookies with heart cutout centers! The cookies are 2cm by 2cm and half a cm thick. The cookies have small little red macro-beads in the center so they glitter! The earrings will be listed in my Etsy shop here. These were voted by you guys to be the next Valentine’s Day items so thanks for the help! I’m extremely sorry this came out so late. I haven’t been feeling well the last couple of days so I took the weekend to relax and rest up. I also delayed my post for Jan 18th (and blacked out my site) due to a the worldwide protest against SOPA/PIPA. I was originally extremely confused about the acts and the purpose of the blackouts on various sites. I felt like it was almost counter-productive but when I tried to look something up earlier yesterday and Wikipedia was gone, it really hit me the ramifications of this bill could have if passed. It is a scary thought that big corporations could have a huge influence on what is allowed and not allowed on the internet and how something similar could be passed in other countries with ill intentions. That being said, I did miss last week’s post (about the new item) so I thought I would combine last week and this week! When I chat with friends and I tell them I’m making cupcakes or donuts, they always ask me if I’m being serious or just working on my jewellery. Anyone who knows me can tell you I can’t cook at all. I have various cookbooks, watch(ed) the Food Network but cooking and me just never mixed. So, I figured I would change that. Starting small of course! I call it the Five or Less project. There are various recipes all over the internet and in cookbooks so the objective of the project is to find recipes that have five or less ingredients and try to make them! I haven’t completely worked out the details so I will most likely post another blog entry later. After writing this blog since May, it is sometimes is hard to come up with a “new” topic each week. I’m still trying to work out the schedule but as of now I have three blog themes each month and one free for all: new item introduction, Bird Reviews & Five or Less. I could try to revive Friday Favorites if anyone is interested where I make Etsy treasuries based on themes. If you would like me to try anything else, please tell me! I’d love to hear feedback!